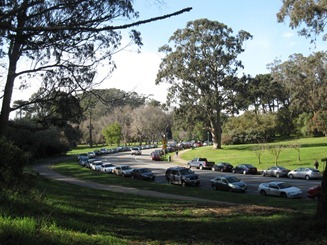 Golden Gate Park sprawls out over more than 1,000 acres. It offers countless paths to stroll and enjoy a break from the city while staying right inside it. Street parking, valid for 3 hours, is available throughout the park. There are also several bus stops within Golden Gate Park. The California Academy of Sciences offers a discount to those who use public transit. Outdoors, special attractions include the Beach & Park Chalet, Buffalo Paddock, Children’s Playground (including the beautiful old carousel), Strawberry Hill, Strybing Arboretum, and the Windmills. Thanks to the mild climate in San Francisco, azaleas bloom in January in Golden Gate Park. 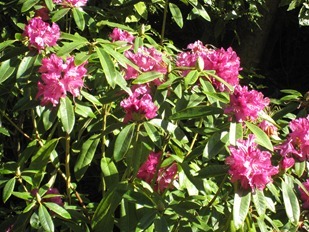 from the AIDS Memorial Grove, the San Francisco Botanical Garden at Strybing Arboretum(free), the Japanese Tea Garden, the Rose Garden (free), Shakespeare’s Flowers (free), and the Queen Wihelmina Tulip Garden. Along with its great outdoor spaces, Golden Gate Park is also home to several indoor attractions. There is the Conservatory of Flowers, the de Young Museum and the California Academy of Sciences.